I write fiction in my spare time and blog for work. I’m always looking for ways to improve my writing skills. This month I discovered Expresso, a web app that analyses and edits text. For example, it highlights words and phrases in your writing that might be less than stellar. 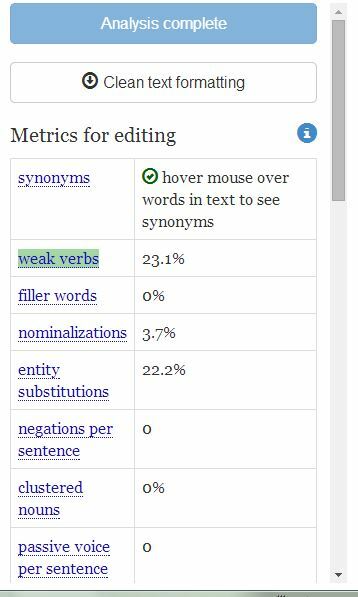 I don’t always use its suggestions, yet among its many metrics, it points out weak words and passive voice. Using active verbs and more vivid, engaging words is an easy and powerful way to jazz up lacklustre writing. Here is a screen capture for the Expresso’s suggestions for the above text, displaying the top results. Computers can help you improve your writing and your life. At Ducktoes we can help make computers work better for you and your life.